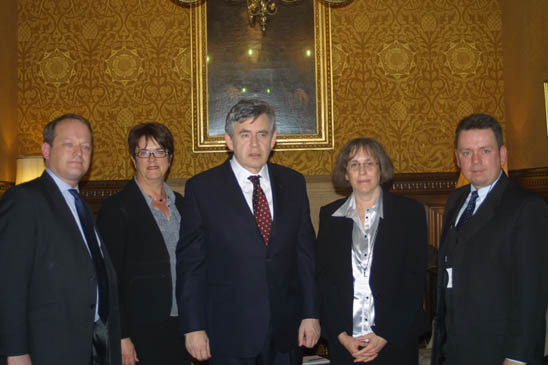 On May 6, 2009, asbestos campaigners Jason Addy and Laurie Kazan-Allen had a private meeting with Prime Minister Gordon Brown in his House of Commons office. On the agenda were a series of issues including: the fatal legacy left by asbestos manufacturing in Britain, the consequences of low level exposures to asbestos, the asbestos contamination of schools and the urgent need for a coordinated national research strategy for medical treatment and cures for asbestos-related diseases. Simon Danczuk, MP Sarah McCarthy-Fry, Gordon Brown, Laurie Kazan-Allen and Jason Addy. Simon Danczuk, the prospective Labour Party candidate for Rochdale, confirmed the intensity of local concern over the area's deadly asbestos legacy. The Prime Minister, who represents a shipbuilding constituency, explained that he had also lost close friends and colleagues to asbestos cancer. MP John MacDougall from the neighbouring constituency of Glenrothes died of mesothelioma in 2008. During the meeting, the Prime Minister suggested involving cabinet ministers in the Rochdale controversy. Having acknowledged the threat posed by low level exposures to asbestos, the Prime Minister confirmed that further discussion on asbestos in schools will take place at a Westminster meeting on May 13. MP Sarah McCarthy-Fry, Parliamentary Under Secretary of State for Schools and Learners, agreed that action was needed to ensure that local councils complied with the duty to manage asbestos contained in public buildings.